I write to you because I am beginning to have doubts about your beer. You see, in a moment of weakness, several months ago, I enjoyed Pabst Blue Ribbon with the famed editor of a literary journal based in San Francisco. However, since I have moved to Brooklyn, I have, at the urging of a few of my readers (I am a writer whose work appears in newspapers and strange magazines, as well as one of these hip new blogs that all the kids are talking about), started to realize that I may have been led astray in my beverage drinking decisions. The famed editor in question now refers to me as “a PBR addict” and I have begun to have strange dreams involving your tall cans. In my dreams, the cans talk to me and are, indeed, taller than me. And at six foot two, I’m a pretty tall guy. So this is somewhat traumatic. The cans tell me that I must drink the beer inside their cans or recite Rod McKuen’s poetry. Of course, I always select the former decision. After all, wouldn’t you? Well, of course, you would. You’re the chairman of the Pabst Brewing Company. But think of me: a casual and overly imaginative consumer of beer. Put yourself in my place! Because of this, I’m under a certain phantasmagoric duress. Your crazy old-school “blue ribbon” logo doesn’t help matters. It makes me think that I’ve won something, when the victory is likely yours. I’ve always thought that America is the place where everyone’s a winner. But how am I winning, Bernard, when I drink a can of Pabst Blue Ribbon? Please tell me. And so, Bernard, we now find ourselves at an impasse. 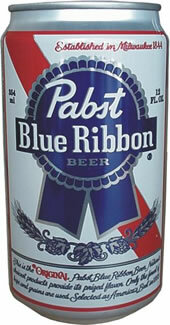 I need some additional faith from you, your company, and your beer — if I am to carry on drinking Pabst Blue Ribbon. Now I’m willing to give you the benefit of the doubt here. Perhaps there have been a few bad cans. Perhaps I have been too trusting of Pabst Blue Ribbon. Perhaps I have been drinking it the wrong way. But I need to know that you mean business. Which is why I am suggesting that you send me a large package, gratis, containing the finest specimens of your beer, so that I might better comprehend your product and possibly rediscover the Pabst magic. I promise to refrigerate whatever you send me, Bernard. And if you give me additional drinking instructions, I’ll follow them to the letter. I have every faith that the two of us can come to some arrangement along these lines which might allow me to better understand your beer. But for now, I must place any future Pabst drinking in abeyance, unless you can offer a compelling reason (or exemplar) for me to carry on through the long and lonely nights. It is important that I respond to recent provocative claims made by Howard Junker before the rumors get out of hand. Junker declares me “a PBR addict.” While it is true that Junker and I enjoyed one enchanting moment in the evening drinking Pabst Blue Ribbon together, I wish to point out that it is largely economic circumstances that determine whether I imbibe a particular beer. When the difference rests between a $3 can of PBR and a $7 Guinness, as it did last week at Happy Endings, well then PBR is certainly the drink of choice. Further, last week, I imbibed two cans of PBR to offer my drinking solidarity with one Ami Greko, who I suspect was thinking along similar lines. I am not one to blow a billfold on alcohol. Do I have anything against PBR? Not really, although I would prefer other beers. Indeed, I welcome PBR over such lesser beers as MGD, Budweiser, and Coor’s. But PBR and Foster’s (and even Tecate) is as low as I will go. There are, after all, certain standards. Of course, if a lesser beer is the only affordable offering on the menu, then I’m not likely to be particularly stingy. Beer is certainly one of Western society’s great beverages, and I do enjoy it. I do not doubt that I am a beer enthusiast, generally titling my palate towards Pilsner Urquell and Guinness, and Heineken, when it is hot and humid. But the word “addict” comes loaded with a certain febrile advocacy, if not the outright suggestion that I should check into rehab. I am sure that Mr. Junker was having his particular revenge with this characterization, and he has succeeded in making me quite curious about the Park Slope literary bar, Pacific Standard. So perhaps the last laugh is upon me. Of course, if any of the beer brewers mentioned on this post (or, indeed, any others) wish to impute that their particular beer is better than the competitors, then by all means send your crates to 315 Flatbush Avenue, #231, Brooklyn, NY 11217 for consideration, and I would be happy to offer lengthy thoughts on how the ales in question affect my palate. I make no promises of endorsement, but I will give your brew a fair shot. If Pabst Blue Ribbon wishes to redeem itself from the “low” rating it has received here, it is likewise open to send crates my way purely in the interest of critical reassessment. Well, who knew that there weren’t a lot of women who imbibed beer in the 1970s? That is, if we believe Michelob. I can find no trace of what happened to MICH VII, although several vintage mirrors seem to be available on eBay. The question is whether Berenden has accounted for those innocent dogs who will no doubt fall off the wagon, demanding harder liquor when the toilet water simply won’t cut it anymore. 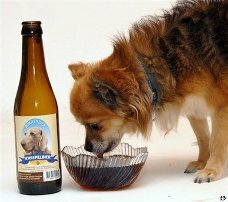 While one can discern slurred speech from alcoholics, with a dog’s vernacular reduced to a select group of barks, this does not bode well for future human-assisted intervention. I hope the pet experts have prepared a litany of twelve-bark programs to assist man’s best friends as they barge their way into convenience stores, a bag of pennies and dimes dangling from their incisors, yelping for forty ouncers.